We all desire beautiful, clear, youthful skin, but many of us are going about getting it the wrong way! Great skin doesn’t require expensive and exotic skin care products. All you need is a great diet and a healthy lifestyle! Although sleep, exercise and stress relief are vital factors to work on over the longer term, making nutrient-rich smoothies is one way you can get a quick boost in skin health. Try to have a smoothie five to seven times per week to pack in plenty of vitamins, minerals and good fats that support beautiful skin. Since different-colored fruits and veggies contain different nutrients, we recommend rotating the color of your smoothie each day. For example, you could start with a green smoothie, then make a yellow-orange one, and then have a red or purple one the next day. Here are five of the best smoothie recipes, packed with the key nutrients for beautiful skin. Consume on a regular basis for a complexion that is clear, bright and youthful! This smoothie is very hydrating and helps improve skin tone, with leafy greens and vitamin-rich fruits. Peel and slice bananas and avocado. Wash and roughly chop leafy greens. Add all ingredients to blender and blend on high for at least three minutes to create a thick, frothy emulsion. Add more coconut water if the mixture is too thick. Vitamin C helps keep skin elastic and bright! This smoothie is packed with flavor and skin-supporting nutrients. Peel and slice the banana and oranges. Start the blending process with the banana and orange juice. Blend for three minutes until smooth and frothy. Add the oranges, mango and pineapple, and blend until creamy. This recipe is packed with the perfect ingredients for skin health. Pomegranates improve circulation and digestion, while almonds provide flavonoids, which are known to improve complexion. Blueberries stabilize blood sugar, which is an important function for great skin. Peel the pomegranate, and roughly tear or chop the greens. Blend all ingredients together for two to three minutes until frothy and smooth. Zinc-rich pumpkin seeds make this delicious drink great for your skin. Begin by making pumpkin seed milk — simply blend the soaked seeds with the honey and 2 1/2 cups of water until liquified and creamy. Add the rest of the ingredients and blend until frothy and smooth. This unique recipe will delight your taste buds and your complexion, too! Peel grapefruit and lime. Peel and core pineapple. Blend all ingredients until smooth, adding water if necessary. 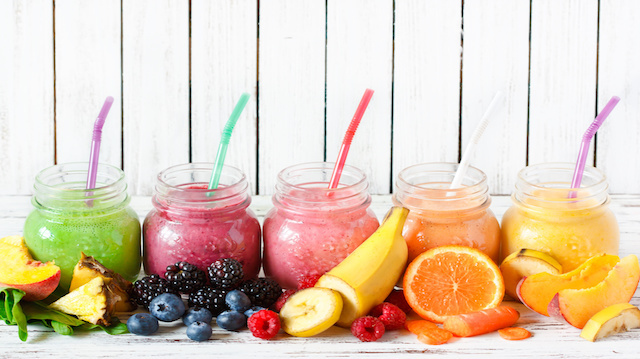 Make daily smoothies a habit and you will see improvements in your skin in a matter of days! Want more? Essential oils are another way to take care of skin naturally. Hey Buddy!, I found this information for you: "5 Best Smoothies for Great-Looking Skin". Here is the website link: https://www.thealternativedaily.com/smoothies-for-great-skin/. Thank you.